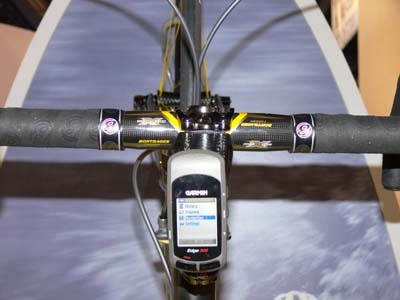 The Garmin booth at CES sported a bike signed by Lance Armstrong that had a Garmin product mounted on the handlebars. There was no information nearby about the little GPS indicator and the bike was mobbed by people just wanting to see Lance’s autograph. Can you imagine if Lance Armstrong had actually attended CES? I wouldn’t have been able to get near the booth. 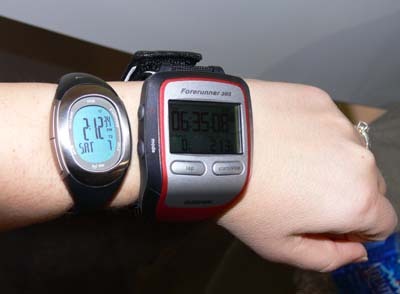 I was more interested in Garmin’s new Forerunner 305. It’s a heart rate monitor and GPS tracker. The cool thing about this huge watch is that it’s supposed to work better in urban canyons and deep forests. GPS tends to have trouble tracking you when you are surrounded by huge buildings, but the Forerunner 305 is supposed to be better in that respect. Of course, the model that they had there didn’t work in the Las Vegas Convention Center, so I have my doubts about how much better it might be. Here is a picture of the Forerunner 305 next to my Nike Imara. As you can see, the display is more difficult to read than my Nike watch, but the Forerunner also has the disadvantage of being huge. The Forerunner 305’s suggested retail price is $377, which is almost four times the cost my my Nike Imara. At that price, I’m sticking with my heart rate monitor and using the Google Pedometer to calculate my distance. It’s probably more accurate in the city anyway. I love the garmin forerunner 301 and anxiously await the new 305. If Ms. Moncur had tried the forerunner 301 compared to the nike, there is a huge difference between the two. I don’t have to use a separate device to calculate distance. My heart rate and distance are always accurate. Not to mention the capability to set my runs up with interval workouts that I can download from the computer or set in the wrist unit itself. The photo of the nike and garmin are an unfair comparison also. Just because the garmin is huge and off to an angle the photo again is not a correct comparison. Take it for a test run! I agree with you Mary!! I’ve never had a forerunner before, but after dumping 349.00 on a 305 as pre-order I agree with you 349%!!! I agree w/ Mary. Ms Moncur must have one heck of a large handlebar & a very powerful WiFi setup to carry her computer on her bike to use Google Pedometer to know her distance while on her bike. All kidding aside, she clearly doesn’t understand the use of such a device. Her Nike Imara gives her the neither the distance nor the speed while on her bike, nor pace while walking or running or pacing herself in a race. The Forerunner also gives you realtime elevation info, including the grade. I don’t see how she uses her watch to substitute for an odometer/ speedometer / pacer & altimeter. I would love to see a comparison of the Garmin 305 and the Nike + iPod, as I’m trying to decide between the two. Actually, I’ve decided to buy the Nike+ since it’s cheap but I still long for the 305. There is a new Garmin Forerunner 405 model out. One of the standout features is how Garmin have managed to keep minimize the number of buttons by introducing a touch sensitive bezel (ring around the watch face). Most functions can be accessed by tapping, holding or running a finger along the bezel – it works even if you are wearing gloves.